Jacob's Crackers: CHOCOLATES " Guilty Pleasures "
CHOCOLATES " Guilty Pleasures "
CHOCOLATES gives Pleasure , it is food for the soul and is sensuous by it's very nature. It is intended to arouse passion and be provocative . We give Chocolates as Birthdays and Anniversary gifts , we make Chocolate cakes for Celebrations , Impress our dinner guests with lavish Chocolate desserts , Boost our flagging energy mid morning with a Chocolate Cookie or gooey Muffin and sooth our souls at bedtime with a steaming mug of Hot Chocolate . 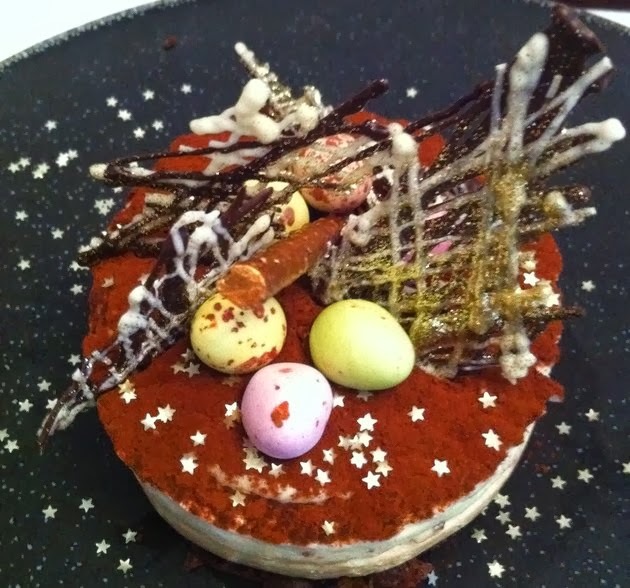 Now , what with Easter round the corner , here are a few of my recipes ideal for this occasion .
" HAPPY EASTER " to all of you and Enjoy as much Chocolates as you wish , Life is too short to feel guilty . Delice au Chocolat : This can be made either as individual dessert or as a main Celebration Cake . The sponge base is a flour less sponge , so ideal for Coeliac . 140 grms of caster sugar . Preheat oven to 180c. Melt chocolate over a bain marie ( a bowl set over a pot of simmering water, making sure that the base of the bowl doesn't touch the boiling water ) and set aside to cool. Using an electric whisk , whisk the egg white to stiff peaks . Now whisk the yolks and caster sugar until thick and pale. Fold in the melted Chocolate . With a spatula , stir in 1/3 of the egg White quickly to loosen up the mixture and fold in the other 2/3 gently. Pour into a lined baking tray and bake for 15 mins until springy . Remove from Oven , cover with a damp cloth to prevent the sponge from cracking and allow to cool. Whisk the egg , yolks and sugar over a bain marie , until thick and creamy . You have just made a sabayon . Now , fold in the melted Chocolate and Finally , fold in the whipped cream . To Assemble : Using Acetate paper , drizzle melted melted white & dark chocolate in a X cross pattern. 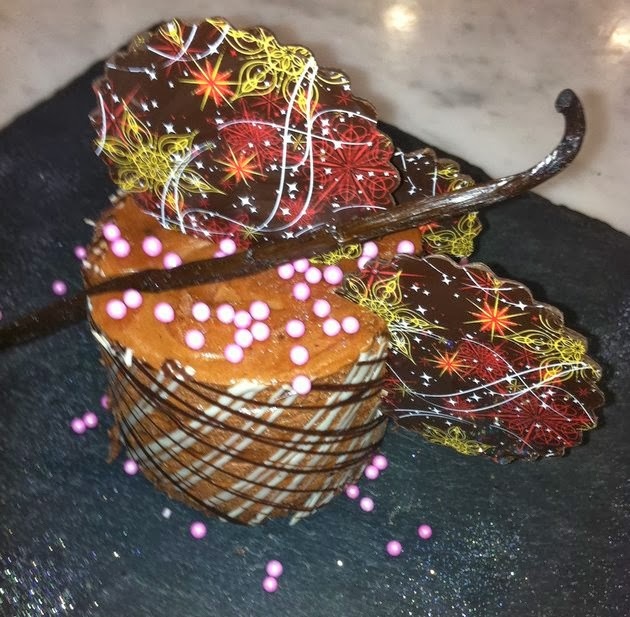 Cut the sponge to the required shape and size , wrap the acetate , with the chocolate on the inside , around the sponge base and secure with some tape . Pipe in the cremeux mix and chill for at least 2 hours or until set . Snip the tape and carefully unpeel the acetate paper. Using a palette knife , dipped in hot water , smooth up the top of the cake. Dust with Cocoa powder and decorate. 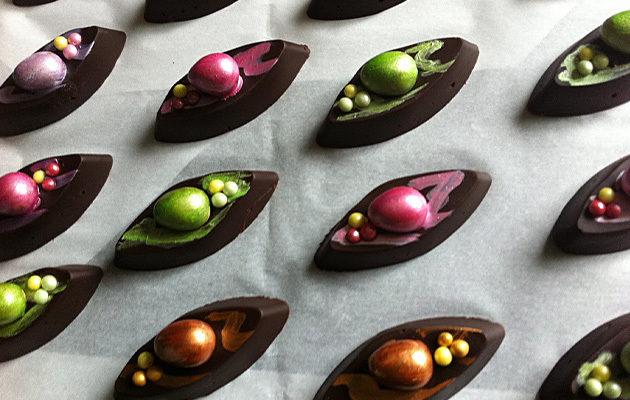 Allow your artistic urges to take over using mini Easter eggs , chocolates shards , berries , sugar decors , used dried vanilla pod . These Truffles with it's sweet richness combined with it's melt-in-the-mouth velvety textures always make it a special treat . Melt your chocolate as above recipe , bring the cream to the boil and pour over the melted chocolate, stir well until you have a thick and fluid chocolate cream. Stir in the whiskey and butter . Mix well until glossy . Line a square baking tray with double layer of cling film , with plenty of overlap and hanging , enough to fold back over the slab once you pour the chocolate in . Chill for several hours until set . Turn over some greased proof paper onto a board and using a knife , dipped into boiling water , cut into cubes or roll into balls ( use rubber gloves as it will prevent chocolate from melting too quickly ) Dust with Cocoa powder , or roll into crushed nuts . Place in boxes , or pile in a bonbon dish . To store : cover and chill, removing them 30 mins before eating. They keep for several days . Here, you will need silicone moulds. Prepare your chocolate as above . Allow to cool . Pour into a piping bag or into a squeeze bottle . Make sure your silicone moulds are dry . Pipe the moulds 1/3 full of the chocolate mix , sprinkle a layer of your chosen praline , cover with more chocolate . Tap the tray on a work surface to remove any trapped air bubbles. Place in the freezer to set as this will allow you to unmould the bonbons much easier . Decorate with mini eggs, sugar decors , crystallised fruits or nuts . Melt some sugar to a light caramel ( golden in colour not too dark ) take off heat and add in the nuts ( Hazelnuts or Almonds or Pistachios or Walnuts ) Pour onto a tray and allow to completely cool and set . Then , roughly blitz in a food processor to obtain a granular mix or put into a plastic bag and bash with a rolling pin or the base of a pot . Very therapeutic !!! !